Shut Up & Knit! : What did I say, Bloglines? What did I say, Bloglines? I said I was knitting socks and I really was. Learned a couple of things, too. These are D-Made's Traveler Socks. I used some Cabin Cove Mercantile worsted weight yarn in a pink from the Barbie series that Dave dyed. The yarn was a gift from Stacey, so I'm a bit hazy on details. The pattern called for US 5 needles and magic loop. I used US 7 DPNs and learned how to do short rows a much better way that I had learned the first time around. You can see my learning curve on the sock on the right. I did a total of seven pattern repeats for this sock, and they fit my US women's size 8 foot perfectly. 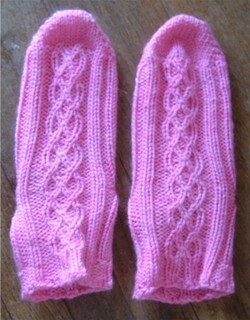 They should as they were knit toe up. If you're thinking about wanting to learn toe up with short rows, this is a wonderful pattern that makes it simple and painless. It also a nice way to get started with cabling if you haven't tried them yet. Oh, and it was a fast knit. I did most of one sock while watching the movie Alexander yesterday. My ribbing is off from the pattern's but I'm okay with that. They are mine and should be a bit off from the pattern. I mean, I am a bit off, right? Love the pattern and will do it again. I think they would make wonderful gifts. But I'm reading the pattern for 'em and it kinda makes my brain hurt. A lot. How absolutely cool are those??? They look like mini Celtic cables. Those are so cute and girly. Nice job! Very cute! I might be able to manage worsted house socks as gifties this year. I'm not doing socks on #1 needles for too many folks this year, let me tell you. Cozy looking! My feet are curling up just looking at them. Very cute socks, they look GREAT. I love the yarn, so pink and cozy. Unfortunately, I'm having a download problem with the pattern--it just gives me martian language and not english. I'll have to keep working on it. Usually my mac and pdfs play nice together. /sigh. Geeez... I challenged you to one pair a week and you kicked those out in what...less than 48 hours. Will you do all my knitting for me? wow. 2 day socks? Why aren't you working in goverment to clean up this country??? Cute socks Cookie, "design elements" included!